A substantial amount of the discussion of international trade issues starts from the premise that the United States has huge trade deficits and China has huge trade surpluses. But what if only half of that premise is true? Here are a couple of tables on trade balances that I've clipped out of the IMF's World Economic Outlook for April 2019. One shows national trade deficits and surpluses in dollars; the other shows them as a share of the nation's GDP. Of course, the 2019 figures are projections. The US trade deficit is large, both in absolute dollars (-$469 billion in 2018) and as a share of GDP (-2.3% of GDP). 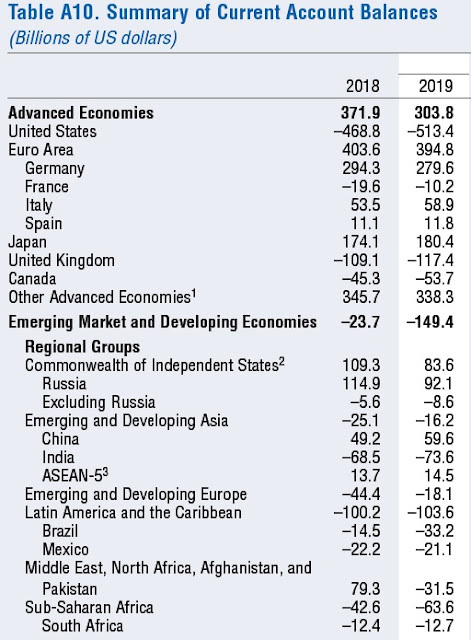 Indeed, the imposition of tariffs by the Trump administration in 2018 is projected to be followed by a larger US trade deficit in 2019--which would tend to confirm the standard lesson that trade deficits and surpluses result from underlying macroeconomic patterns of domestic consumption, saving, and investment, not from trade agreements. But China's trade surplus is not especially large, at about $49 billion in 2018, which is 0.4% of China's GDP. Indeed the IMF is projecting that China's small trade surpluses will turn into trade deficits by 2024. As China's population ages, it has been shifting toward becoming a higher-consumption society, and its trade surpluses have fallen accordingly. What other countries have large trade deficits, like the US? And if it's not China, what countries have the large trade surpluses? The US has by far the biggest trade deficit in absolute terms. When measured as a size of its economy, however, the US trade deficit is smaller than the trade deficits in the United Kingdom, Canada, South Africa (or the nations of sub-Saharan Africa as a group) and India. When it comes to trade surpluses, the absolute size of the surpluses in Germany (+$403 billion), Japan (+$173 billion), Russia (+$114 billion) and Italy (+$53 billion) all outstrip the size of China's trade surplus (+$49 billion) in 2018. These economies are also smaller in size than China's, so as a percentage of GDP, their trade surpluses are larger than China's. Also, trade surpluses for the "other advanced economies" is large. This group is made up of the advanced economies outside the Group of Seven countries listed in the table and outside the euro area, so examples would include Korea, Australia, Norway, Sweden, Taiwan, and others. One final note: Measures of international trade flows are imperfect. An obvious illustration of this point is that the world balance of trade must always be zero, by definition, because exports from any one location are imports for some other location. 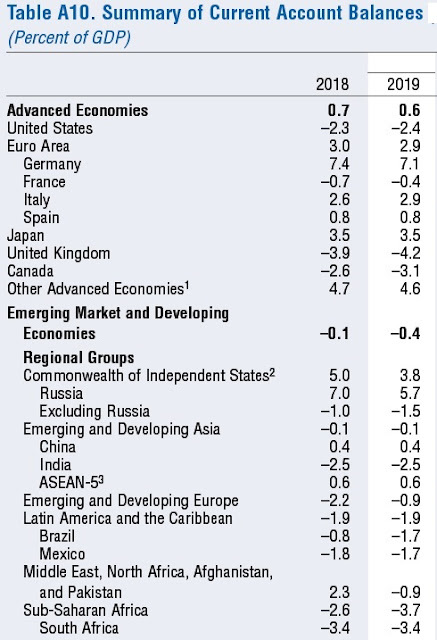 However, these tables show the world as having an overall trade surplus projected at $154 billion in 2019. I guess Trump is right. Make America Great Again !! The US trade deficit is MASSIVE !! !